Manorama Yearbook which has a reach of lakhs of readers is one of the popular concise encyclopedia of current affairs published annually by Malayala Manorama Group. Available in various languages including Malayalam, English, Hindi, Tamil and Bengali, this year book is well liked by the reading community in India. The English edition which was first printed in 1965 has successfully completed 49 years of its publication. The 2014 edition of this general knowledge companion is now available in the stores. Typically, the content of the Manorama Yearbook covers condensed information on people who are holding public offices, receiving major awards or recognition and involved in newsworthy events. Along with places with status about the demography, capital, economic data, and political status of countries, Indian states, population and literacy, this encyclopedia share various events and other notable developments. 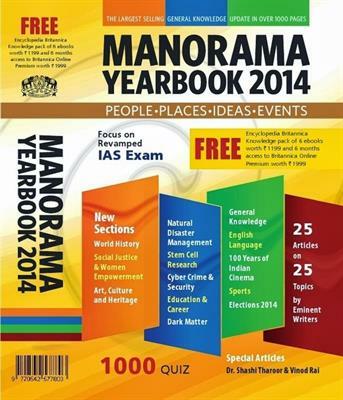 This highlight of 1040 pages English edition of Manorama Yearbook 2014 would be the various sections including world, India, Science, Information technology, General Knowledge, Sports, Current affairs and culture. It also gives an updated statistics about this fabulous world and new information. Being one of the most circulated and popular reference book in India and rest of the world, this edition deals with topics ranging from science, educations and history of sports, literature and entertainment and many others. Regarding the content of Manorama Yearbook 2014, it covers the following topics. Manorama year book is one of the largest selling general knowledge update in the country which is widely used by candidates who appear for competitive examinations while a teacher and researcher can use effectively in his pursuit of knowledge. This edition of the book comes with a 'Free Encyclopedia Britannica with CD – ROM'. The book also gives alert on various exams like Civil Service, Combined Defence Service Exam, Combined Defence Services Exam, Geologist Exam, Special Class Railway Apprentices Exam, National Defence Academy & Naval Academy Exam and various exams which are being conducted time to time. Articles in condensed form are helpful for students and job seekers to get a precise knowledge about various topics without going for year another reference book. Manorama Yearbook is recommended by eminent personalities after enjoying its taste.